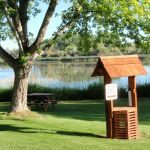 Ask fellow campers about "Snake River RV Resort" and nearby attractions. The CG is located adjacent to an industrial area just south of downtown Homedale, ID. All interior roads are gravel; all overnight sites are set on a thick, well-watered, lawn. Once the CG fills to capacity, sites may feel a bit squeezed together. The ground under our trailer was wet from watering, but firm, so leveling was not an issue. All utilities worked. No cable TV. We had a picnic table, but we chose not to sit outside - lots of mosquitoes on our site's squishy lawn. Most sites had plenty of shade trees. Front row sites have river views. Outer rim of CG filled with permanent residents in 4-season houses. 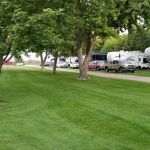 Several campers we spoke with were repeat visitors: they really liked the river setting and overall manicured look of the grounds. We will likely not return because we couldn't adjust to the 24/7 hum of the adjacent sawmill/factory. 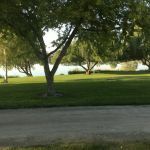 We camped at Snake River RV Resort in a Travel Trailer. Best park we have stayed in during our month-long trip. All Boise parks were full and I'm so glad we ended up in Homedale, even though we had to drive a ways to our events in Boise. The grass sites right on the river were wonderful and peaceful. Would have ranked a 10 except there was only 1 combination toilet/shower for women and 1 for men. (I used the men's when the women's was busy.) Will go out of our way to stay here again if anywhere in the area. (Sawmill noise just "white noise" and not bothersome.) 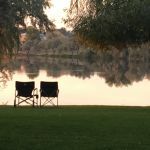 We camped at Snake River RV Resort in a Motorhome. The campground is immaculate, the restrooms so-so, not many toilets and only one shower. The entire park is green grass with sprinklers going all afternoon. there is a rumble/buzz from the sawmill next door that I think would be forgotten after a few days. The drive in does not prepare you for the beauty of the campground. We came from Boise, to the East and got off on hwy 55 to 95 then took hwy 95 to the signs. The Jump creek road is all gravel so I don't recommend that option, go one street further to Pioneer Rd. In my opinion, it would be nicer and easier to level on a gravel path or cement patio...the grass underneath is wet and we had a hard time leveling. Each to his own. BTW, this is not a party place by the river; strict rules and quiet. Shop ahead of time. Nice. We camped at Snake River RV Resort in a Motorhome. Our river front pull through was a 50A full hookup site. Sooo peaceful. They also allowed me to wash our coach with irrigation water (was very clean). Highly recommend. Don't let the drive into the facility scare you. We are 38' plus towed and did fine. Will stay here again if we return to the area. We camped at Snake River RV Resort in a Motorhome. This is a beautiful location, do not let the ugly road in or the front of the CG stop you. There was no one in the office when we checked in as of this point we have not seen anyone. It has mostly full timers but the great spots are saved for shorter states. Our site 36 was front row with a beautiful view of the Snake River. No cable but the rest of the utilities where fine. You park on grass that is well kept and the sites are wide and long with shade. The roads are tight and as are the turns. We will return to this wonderful park if it had more amenities we would have scored it a "10". We camped at Snake River RV Resort in a Motorhome. There are wineries in the area and beautiful farm land. Boise is about 45 minutes away. A very pleasant park with nice shade trees and beautiful landscaping. Sites are right on the Snake River. They are long, grassy spaces with conveniently located utilities that functioned properly. The owner seems to run a 'tight ship' which is very much to our liking. To get to the park, you must drive through an industrial area, but you never even know it's there when you're in the park. No noise from that, or from the mobile homes that are also part of the facility. 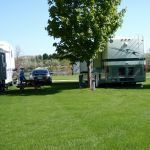 We camped at Snake River RV Resort in a Fifth Wheel. If you're in the area for a few days, be sure to visit some of the nearby, excellent wineries that are part of the Sunny Slope wine Trail. Access from US 95 is easy following the signs. We got a little nervous at first. The park appeared to be in an industrial area but we did not have any issues with noise or anything. Check in was quick, easy and informative. The owner gave us a choice: The back row was pretty vacant if we wanted privacy or the front row (water front) as long as we were okay with neighbors. We chose the front row and we were glad. The parameter roads were gravel and easy to access. The sites are all on grass which has its merits and draw backs. Our site looked at first to be unlevel but when we applied our levelers we discovered that it was pretty even. There is plenty of room between rigs. The services are to the left rear and all worked well. The front of the park is on the banks of the Snake River. The landscaping is beautiful and well manicured. You can tell the owner cares about the grounds. Rules are pretty basic and easy to follow. We did not notice any dogs off leash and did not find any doggy do. Folks here seem to abide by the rules. This park should get a ten but for one picky point. We like to have a mat at our door. Understandably, they are not allowed as the grass beneath would die. We love the grass but would rather have a concrete pad with a small patio. We paid $32.00 per night with G S discount and feel we received good value for our dollar. We would return. We camped at Snake River RV Resort in a Motorhome. We did not leave the park so do not know if there are any restaurants or services withing walking distance. Pull through sites on grass (so no carpets, etc. ); FHU with good electric but the water had a sulfur smell and taste. Right on the Snake River so you can fish and sit by the river. Had a boat ramp to get into the river. No playground, no rec hall, no pool. Had mobile homes on property. Hiking trail next door around the corn field so I was able to let the dogs loose there. 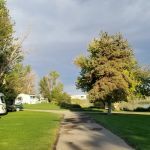 We camped at Snake River RV Resort in a Travel Trailer. A nice campground that is situated right behind a factory and is very well maintained. All the lots are grass and plenty of trees. Yes, there are a lot of bugs but the shade was nice. The river contains mainly catfish as it's very slow moving. There is only one stall and shower in each of the gender bathroom and kept very clean. Laundry has two washers and two dryers. Cost to wash is $1 and 75 cents to dry. There is a small farmer's market on Thursday from 3:30 - 7:30 pm. Wifi was decent and our T-Mobile cell phones had good reception. 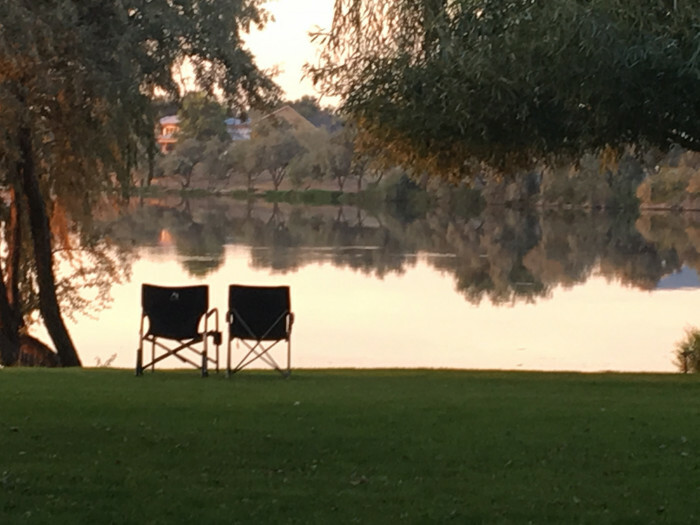 We camped at Snake River RV Resort in a Fifth Wheel. Large grassy sites, yes, park on the nice green grass. Mature trees for shade. My site was not level but worked for one night. Looked like it took a lot to level most sites. A nice view of the river. I would stay again. We camped at Snake River RV Resort in a Motorhome. Very nice grassy park right on the river. Clean and well maintained. Self-check in so no rating for service. The mill next to the park made minimal noise- not an issue. 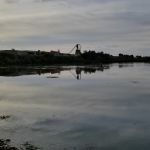 We camped at Snake River RV Resort in a Travel Trailer. Very well kept Park thanks to the park manager Dave! Beautiful pull thru grass sight with view of the Snake River! Would definitely stay here again. We camped at Snake River RV Resort in a Motorhome. Great place to stay for a weekend, but the industry that a abuts the park runs until 3am during the week and the constant droning of the machinery and beep beep of the forklifts drove me crazy. The constant lawn mowing, sprinklers running and leaf blowers only added to the discomfort. As I said, a great place for a weekend but to be tolerated during the week. And I have not mentioned the gnats that even closed doors and windows can not keep out. We are still getting rid of the Japanese bean beetle ( looks like orange lady bugs) infestation. It's set up great for groups to get together, just know what you will be experiencing. 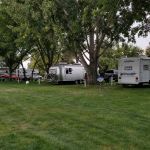 We camped at Snake River RV Resort in a Fifth Wheel. We stayed in this park for a month. The caretaker was very friendly & kind. He keeps the grounds immaculate & clean & you feel like you are living in a park. He watches out for you & helps out in every way you need it. Everything is very clean & the permanent campers are friendly & nice. We definitely will becoming back! This place is pet friendly too! Wifi was a plus. 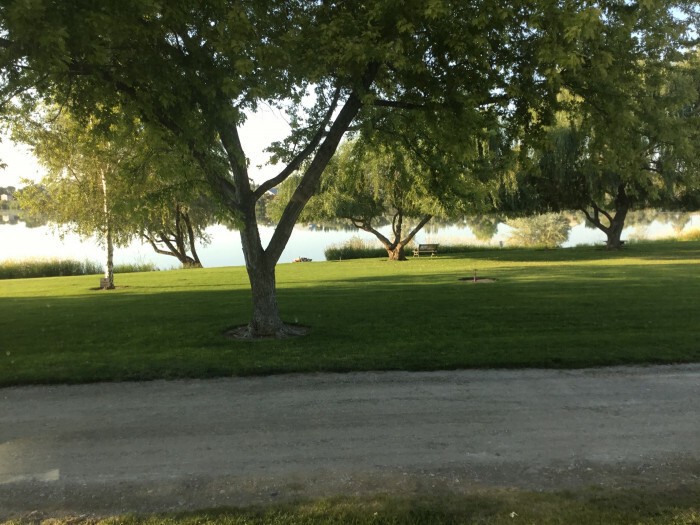 We camped at Snake River RV Resort in a Fifth Wheel. There's a restaurant right next to the bowling alley in Homedale that has great food. Moxie Java has homemade bakery items & if you go in some shopping inside. The people of Homedale were very friendly. We loved the country setting away from the busy city. A visit to Jump Creek Falls and the Warhawk Air Museum are highly recommended. Go fishing, play horseshoes, watch the squirrels and relax and kick back with a beverage. Oh yeah, it is camping time. 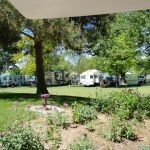 Are you affiliated with Snake River RV Resort ?